We're halfway through the One Room Challenge and it's starting to get even more exciting. Welcome back to week three! I'm so glad you're here. If you missed week one or two, be sure to click on those to catch up. Last week I shared the vanity hardware. You may be thinking "those are pretty but how is she going to bring in those colors." Art. 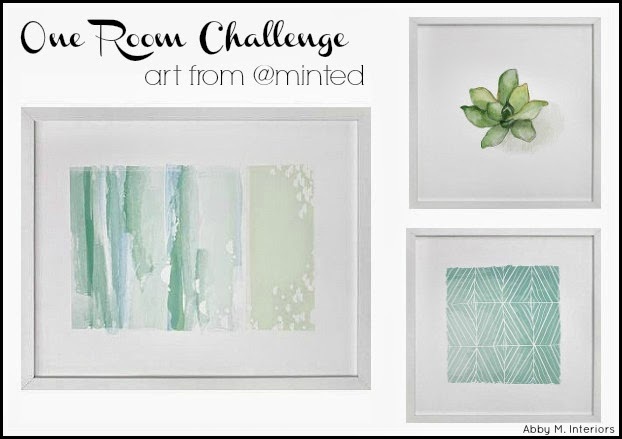 Minted is one of the generous One Room Challenge sponsors, and I went a little crazy. I used to think Minted was just about paper. In fact, my business cards are from Minted and I get complements on them all the time. I've even used them for wedding shower invitations. But now...oh my goodness...they are the place to check for art. Here's why: not only are their limited edition prints beautiful, but they support independent artists who otherwise may not be in stores. I'm all about supporting our artist friends. 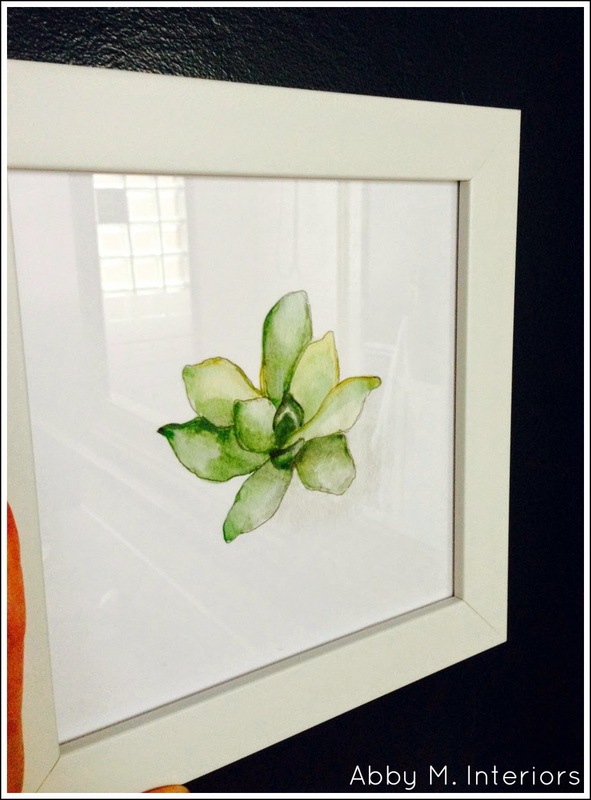 You can select framed or unframed, and they have quite a few choices on the frame. I went with all white frames because I wanted the contrast with the walls. The art is not installed yet, because I need to maintain some element of surprise for "the big reveal" ;-) but I want you to see them in all their glory. Because I love them. Just as a little background, I did try to use a vintage chart of whales that we already have in my son's room, and he boldly told me that he was NOT going to look at whales while he went to the bathroom. What?! Mkay. Noted. So rest assured that all art was approved by my boys before it was ordered. This is the bathroom they share with our guests. I started big. This print is technically supposed to hang vertically, but I thought it was too perfect to pass up, so I'm installing it horizontally. The colors are ideal. This is a smaller print, and I apologize for my hand in the photo, but I love the soft gray-blue color and the subtle pattern. This watercolor...so pretty. You know I'm crazy about green, and anything nature related fits right in. They won't all next to each other, but I put a board together to give you a better idea of how the art works together. *Designer Tip: mixing art is like mixing fabric patterns. Keep the sizes of the patterns different. For example, I have a solid in the watercolor, a medium sized pattern in the geometric, and a larger scale pattern in the abstract. Of course rules can be broken, but use this as your guide. In other updates, you may remember this fancy faucet from the first week. I have no doubt it's original to our 70's ranch home. The beige sink...who thinks of that? Who decided that the ideal color of a sink would be something slightly dirty looking. It has served my boys well for three years, but the faucet and sink are out of here. I hunted and searched for the perfect faucet for the bathroom. I found this polished brass faucet here. **Designer Tip: don't be discouraged by the ugly photos some businesses use to sell their products. This may seem obvious, but if my bathroom had the wallpaper in the above photo, I would poke my eyes out. You need to close your eyes, remove all the ugly, and picture the piece in your room. I was a little nervous that maybe the faucet wouldn't arrive, because the price was so affordable. Like maybe it was a too-good-to-be-true trick of the internet. But she arrived in all her her glory and I couldn't be happier. I mean really...she looks stunning against the wall color. Am I right? If you're reading this then you're obviously very design savvy and up on the times, but spread the news to your friends that brass is here to stay. I know some are resisting, but it's not going anywhere for a long time. Lest you think I'm nearly done, please know my punch list is crazy long...I may not sleep until the One Room Challenge is over. But it's totally worth it! 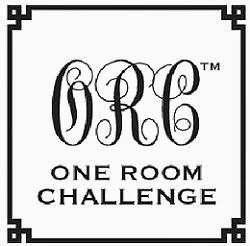 Thank you to my One Room Challenge sponsors. Now let's see what the other challengers have done...that's really my favorite part. Everyone has such a different take on their space and a different process. So thankful to be part! Hi Abby! Great post. That artwork is so gorgeous. I have to check out Minted. Dying to see how you handle that tub situation. My bathrooms need serious love so I'm hoping to pick up a few ideas ;-) Good luck this week! The faucet is just wonderful. I love the color palette for the room. Your palate is so so pretty and you know I lurv that brass goodness!!!! OK...I wanted to use some art from Minty but I could not decide:( Now after seeing yours....wish I had focused a little better..... I am so wishy washy. Glad the faucet turned out OK....it is scary to order off the internet sometimes. This bathroom is going to be pretty special I can tell! i want to just kiss every part of this space. who knew minted carried art? not me. thanks for the tip! This is so exciting! I LOVE bathroom reno's! 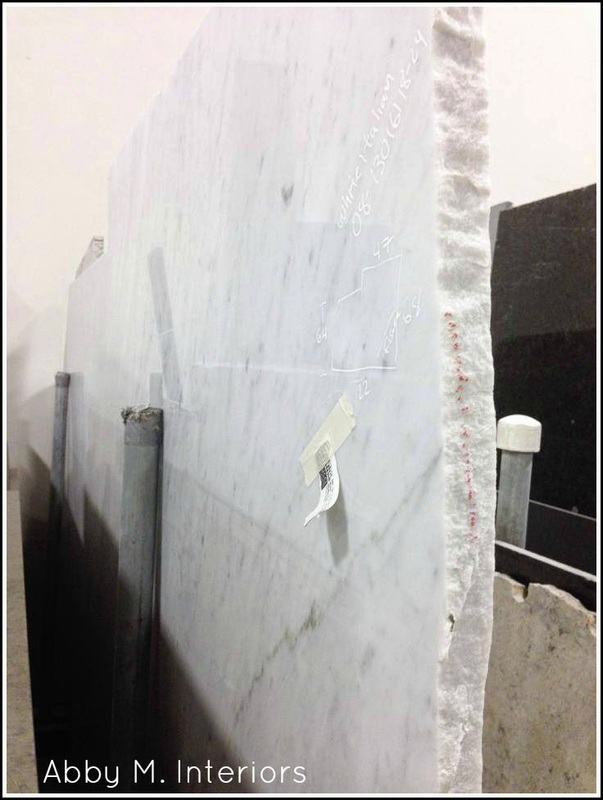 Cannot wait to see that GORGEOUS marble installed!! ooohhh...that faucet is very very exciting indeed. Yes!! so so so good! that faucet is gorgeous and omg the counter! THE COUNTER! Great choices in art too! Looking good! Such a beautiful tease...can't wait to see everything together! That slab is so gorgeous! Your brass faucet is very, very stunning and looks very luxe. The marble slab look equally gorgeous too! I'm so excited to your faucet and that marble become close friends! This is looking fabulous! I love the art you selected. And I did not know that Minted had more than just paper! I'm so excited to see how this turns out. Your color selection and fixtures are killer. I saw those knobs at Anthro the other day and had no idea how big they were - they are GORGEOUS! This is definitely going to be a stunning room! omg so pretty. love how well the art goes together. Love your little assistant's art choices! 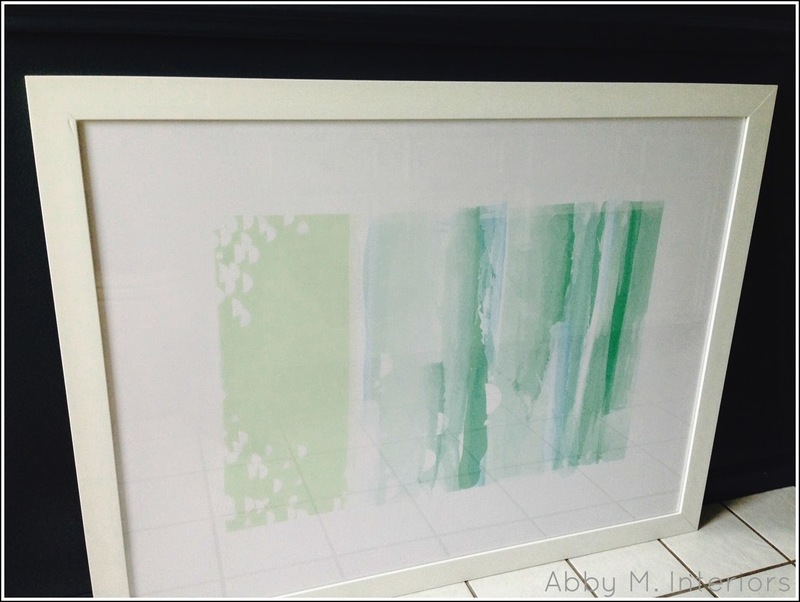 I didn't realize Minted sold art either! It's going to be stunning against the dark walls and that brass fixture is amazing!! The art is so pretty Abby and that teaser!!! Whoa mama……love it! This is looking fantastic. That faucet is so lovely, and I might have been put off by that ugly wallpaper, great tip. Love your art selection. Pretty faucet!! I love it...and that marble slab! can't wait to see it in place. The art is amazing. I love that collection you designed. it will go so beautifully with the pulls. This is looking soooo good!! Wow, I love the art! And I love brass! So glad it is "back!" That faucet is gorgeous, I'm so excited to see everything come together! So many fantastic things happening in there!! That faucet and those counter tops...beyond gorgeous. I love all of it! You have such a good eye! Can't wait to see the finished project. Wait!!! You're painting the tub and tile?! Can. Not. Wait. I so want to paint our tile but I'm scared. Looking forward to seeing how yours turns out! That faucet is amazing! Can't wait to watch this bath come together! So, so good, Abby! That faucet is calling my name for my powder room. The marble is heaven. And I love your art selections! 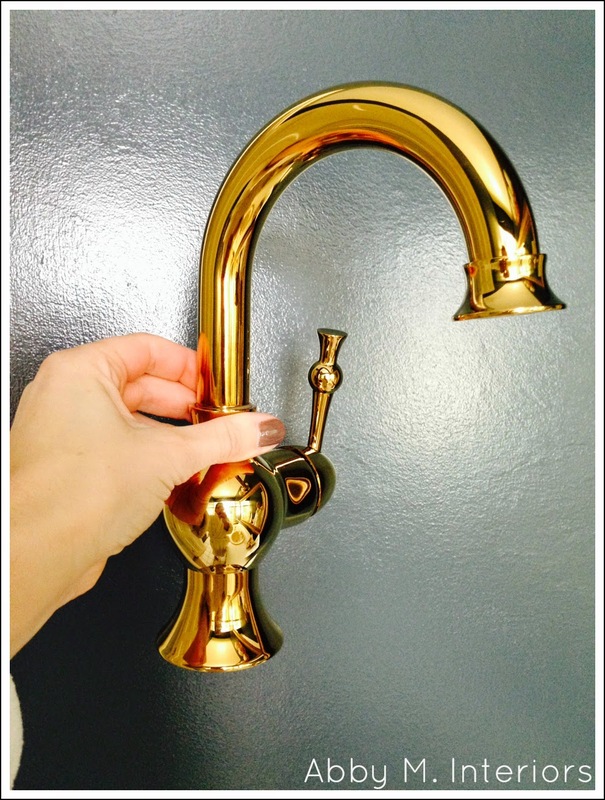 I love your color choices and the brass faucet! That faucet and that slab?!!! Super jealous. This is going to be smashing. Great art choices and tips. Whenever I read one of your post, I always walk away a little smarter. Thank you for being so generous with your useful tips. Don't know if you are planning on installing marble tile on the floor, but from my experience it's not a good idea when boys are using the bathroom. If you know what I mean. You have divine taste! 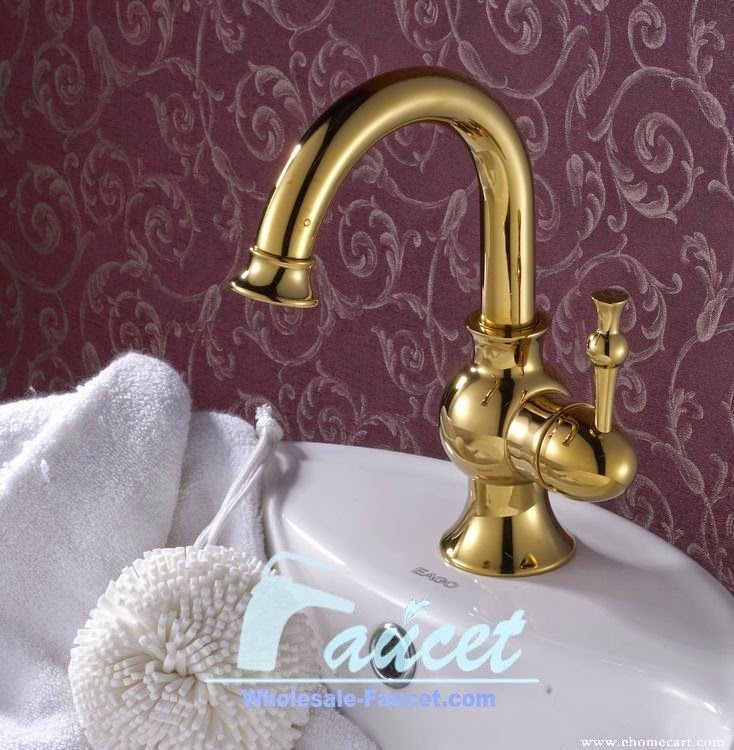 I love everything--art, brass faucet, wall color, etc! Can't wait to see the reveal. It's coming together so beautifully Abby! Love the faucet you found and all the Minted artwork! Looking forward to the whole thing coming together!! 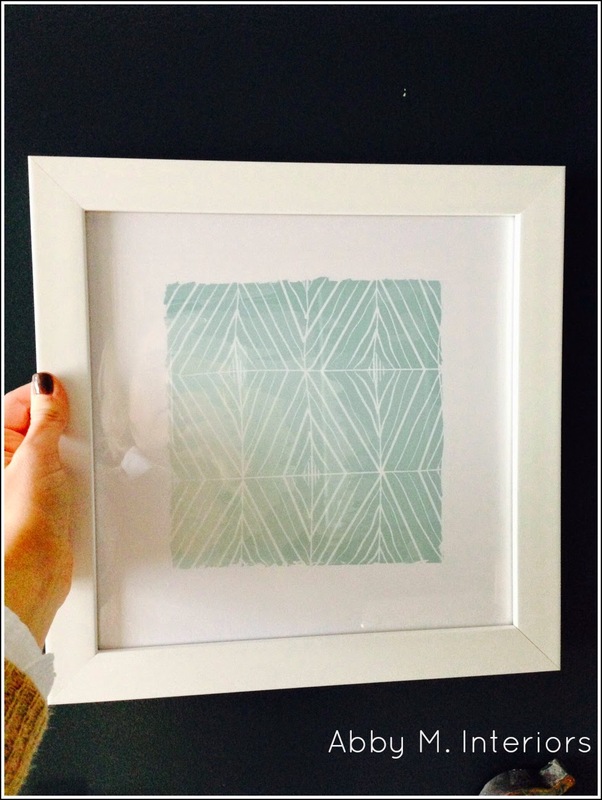 Love the Minted Art! Love the faucet, love the art, love the teaser, love the tips. It is looking so great! lots of good things happening here!! Nice job. Can't wait to see the reveal! That cabinet pull is fab. There's nothing like a deadline for making you finish your own projects! The elements chased are beautiful! I love the cabinet pull and the artwork to tie it in!!! This is so fresh and gorgeous...loving your ideas! Don't you love the crazy chaos of the ORC?! I do even though I am starting to seriously get nervous! Your bathroom is going to be so gorg!